Get FREE Gifts value $600 with Westin Offer at CARiD! - Ford F150 Forums - Ford F-Series Truck Community. Make your brand new F150 look like a real off-road truck with Westin HDX Bumper! Each rugged bumper is made from heavy-duty, 7-gauge steel which is able to handle any challenge you may face and keep your front-end well protected from dents and road debris. It features a textured black powder coat finish, that protects the bumper from corrosion while making it look great. Mount up to two 10" LED light bars. It can accommodate up to 8000-12000 Lbs. winches up to 10.25 in. and bolts on directly to your truck’s frame. Now besides getting a bumper Westin gives you a chance to get FREE gifts. 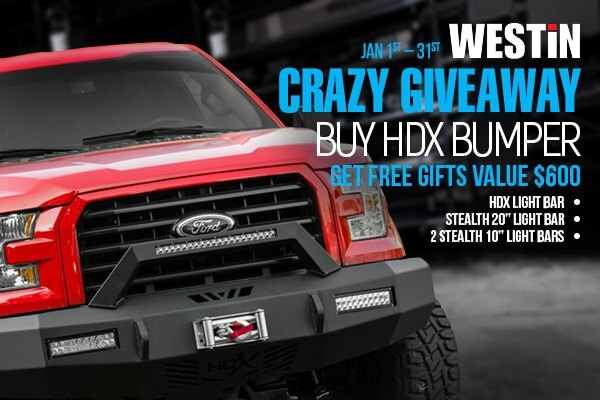 Purchase any Westin HDX Bumper and get HDX Light Bar, Stealth 20” Light Bar and 2 Stealth 10” Light Bars for FREE (a $600 value). Don’t waste your time and take part in this great offer. This promotion is valid from January 1 through January 31, 2017. When you thought gift season is already over, Westin is here to surprise you! Quick Reply: Get FREE Gifts value $600 with Westin Offer at CARiD!